The Tri-City Herald has an article on the Coyote Canyon Mammoth Site. KNDO/KNDU TV has a story and video on their website today about extracting one of the mammoth humerus bones at the CCMS dig site. Check them out! Story: No longer on KNDO/KNDU TV website. Note: The link will take you outside the CCMS website. Any problems with the video playback should be referred to KNDO/KNDU TV. Fourth graders from Rosalind Franklin STEM Elementary School, Pasco, visited the Coyote Canyon Mammoth Dig on Oct. 16. They learned about Earth's geological processes, floods, and mammoth bones. Photos from the visit are here. Peter Johnson has prepared a brief presentation of the research conducted on the Coyote Canyon Mammoth Site. See student researcher Kaitlin M. Hill’s (co-author George Last) STAR Program poster “Lithic Analysis of Coyote Canyon Mammoth Site Sediments” on the Cal Poly - San Luis Obispo website. Mrs. Magrini, a school teacher from Mountain View School in Mendham, NJ, participated in a research project to conduct XRF (X-ray fluorescence) analyses on soil samples from the Coyote Canyon Mammoth Site, and to present the results. Her participation was through the Siemens STEM Academy. See her informative blog here. Sixty-five second graders from Connell Elementary school visited the Coyote Canyon Mammoth Site today. The kids visited the display room and picking lab in the dig house. They also learned about how and where the mammoth was found and is being excavated, and how the material from the dig units is washed and dried in preparation for processing in the picking lab. Parents and teachers accompanied the classes and all were quite impressed. A video crew from WSU Tri-Cities was on site to interview dig staff members and record the activities. Kennewick teachers learn about paleontology at mammoth dig site - No longer on site. Scientists establish age of mammoth found near Kennewick - No longer on site. Mid-Columbia middle school teachers learned archaeological digging techniques at the Coyote Canyon Mammoth dig site in Kennewick. David Lanigan from popular local Celtic band Skweez The Weezle visited the site today and presented mammoth researchers Gary Kleinknecht, George Last, and Bax Barton with a framed print “Napoleon in His Prime” by artist Carl Dennis Buell. 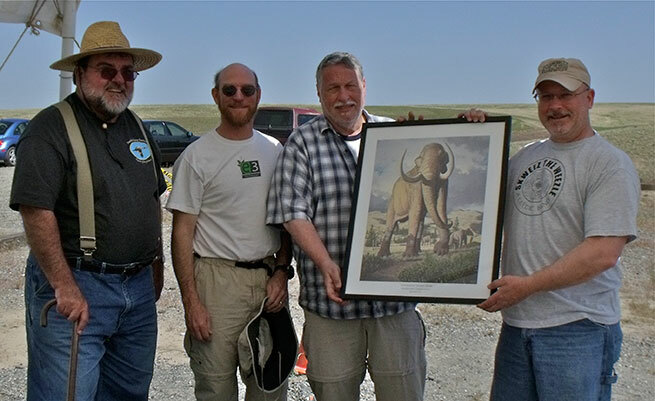 The print of a bull Columbian mammoth now hangs in the Coyote Canyon Mammoth Site Dig House. The MCBONES Research Center Foundation has received a $10,000 grant from Battelle Memorial Institute for enhancing the Research Center’s laboratory capabilities - equipment, materials and analyses, primarily at the Coyote Canyon Mammoth SIte.